Not all rentals are created equal. We pride ourselves on offering desirable quality rental instruments and by maintaining them beautifully. We also offer step up, and high end models as rentals for students who have advanced, but do not have a budget to purchase a suitable instrument. 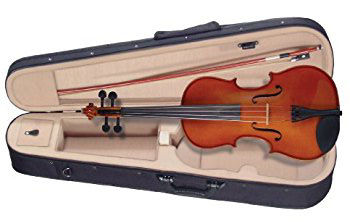 We can customize your outfit with a specific choice of case, bow type, strings, etc. You won't be stuck with whatever we happen to give you. Other stores expect you to have lower expectations for a rental outfit, but not us. We understand that success learning a musical instrument should not be hindered by an instrument that is uninspiring or is difficult to play. 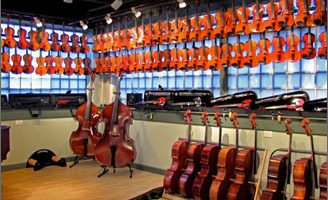 80% of ALL your monthly payments go toward a future purchase of an instrument. Change sizes freely at no charge. FREE regular maintenance. String replacement, bow rehair and adjustments cost you nothing. Damage waiver optional. If you choose, you can protect against the loss due to accidental damage, for a small additional monthly fee. In-House billing. No more icky 3rd party servicing. Step-up, Intermediate and Advanced instruments are available on our rental program. Almost anything we sell can be structured as a rental. 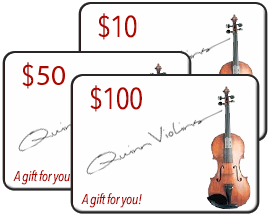 Free Quinn Violins T-Shirt with every new rental contract. 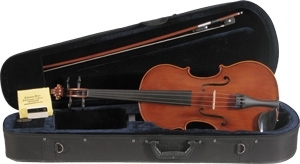 Violin Rentals from $24.01 per month. Great Rent-to-own terms. Viola Rentals from $26.02 per month. Great Rent-to-own terms. Cello Rentals from $34.03 per month. Great Rent-to-own terms. Double Bass Rental starting at $79.07 per month. Great Rent-to-own terms.